Alfalfa has been grown for many civilizations for over five thousand years. Alfalfa was planted in hot, dry regions of Mesopotamia before recorded history. Alfalfa is grown throughout the world under extremely varied climatic conditions. Alfalfa seeds are in the legume family. The name "alfalfa" means "father of all foods.” The saponins in alfalfa sprouts may help to reduce cholesterol. They contain significant dietary sources of phytoestrogens connected with prevention of menopausal symptoms, osteoporosis, cancer and heart disease. 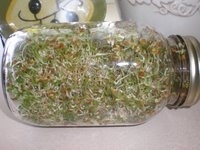 Alfalfa sprouts are full of nutrition. Research shows that sprouts are loaded with antioxidants, and are full of protein, chlorophyll, vitamins and amino acids. Sprouts contain enzymes which digest themselves. They add enzymes that heal the body, aid in digestion and are affordable. Enzymes are considered the key to longevity and are abundant in sprouts. Sprouts have the largest relative content of nutrients per unit of intake of any food known. More nutrients reach the cells with less food. Research has shown sprouts to have high levels of disease preventing phytochemicals. They contribute to better health by prevention to treatment in life threatening diseases. Sprouts are widely recognized by those who are nutrition conscious and health care professionals as a wonder food. Home sprouting can supply delicious fresh food without the environmental toxins. They require no soil, only water. Sprouts are usually added to other foods. They are completely natural and known for their powerful nutritional and healing properties. Sprouts continue to grow even after you have eaten them. Alfalfa is the most famous sprout in the United States. It has a mild flavor, an abundant amount of nutrition, and easy to grow. Alfalfa sprouts are low in calories, about 10 calories per cup. Other nutritional information include: vitamins A, B, C, E, and K. Alfalfa sprouts contain more vitamin C than oranges. They also have calcium, iron, magnesium, phosphorus, potassium, zinc, carotene, chlorophyll, amino acids, and protein - 35%. Seed to sprout: 5 to 6 days, yield: 7 to 1, sprout shelf life: 2 to 6 weeks, sprout seed shelf life at 70 degrees: 3 to 4 years.